I've been asked a lot about Team Canada leading into these Olympics, and for the most part, my responses have been pretty positive. This is, after all, a remarkably different team than the one that finished seventh and was essentially a disaster in Turin four years ago. In all, 15 of the 2010 team's 20 skaters are newcomers (if you include Niedermayer). Nearly half (seven) of those came out of the world junior class of 2005, as stacked a team as we've seen in that tournament: Seabrook, Weber, Bergeron, Crosby, Getzlaf, Perry and Richards. Fleury played for the 2003 and 2004 teams, Doughty in 2008, Toews in 2006 and 2007. Morrow played in the 1999 tourney. Incredibly, Keith and Staal didn't play at all at the world juniors. Neither did Marleau or Boyle, who made his international debut in 2005 with the world championship team at age 28. 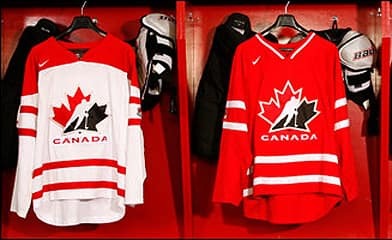 Canada won gold in the juniors from 2005 to 2009, five straight times, and a lot of their new recruits (nine) came from those tournaments. The international success is there, albeit at a different level, and that alone leads me to believe this team will have more success than the group in Turin. It's worth mentioning that Staal and Marleau didn't compete in the World Juniors because they jumped immediately into the NHL after being drafted.